Friday, hundreds of women (and a few men), poured into The Woodlands Resort and Conference Center for a luncheon benefiting Interfaith Community Clinic for the sixth annual Women Empowering Women luncheon. 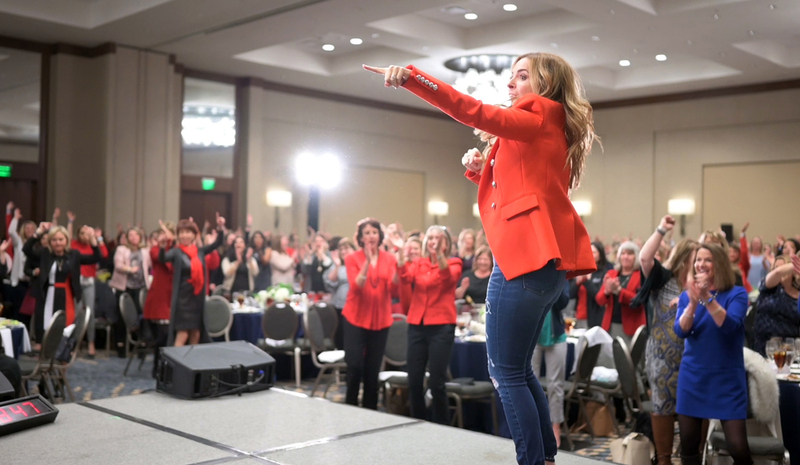 And with a sold out event, this one was going to be a huge hit.... because Rachel Hollis, event planner turned blogger, was going to give The Woodlands a treat they were not expecting. Rachel Hollis is the #1 New York Times best-selling author of Girl, Wash Your Face, a TV personality, top motivational speaker, popular podcast host, and known as "the Tony Robbins for women." Hollis tells it like it is, has a refreshing approach to empowering the female audience and helps arm them with the tools to make a positive and lasting change. With a bold entrance to Beyonce’s hit song “Run the World (Girls)”, she challenged the over 700 women attending Friday's luncheon to think different, to live different, and to dream different. With a resounding theme of “you are enough,” Rachel defined many ways to both inspire her listeners and direct them to improve their lifestyles and business. She gave chilling life examples and told colorful stories about comparison and insecurity, loss and triumph, and most importantly, LOVING YOURSELF. “Instead of asking why is life happening TO me? Ask yourself what if life was happening FOR me? Everything isn’t good but you can find meaning in everything - even the most difficult and challenging situations or experiences. Look for the meaning in everything,” Rachel Hollis said. Women Empowering Women is a non-profit fundraising event that helps Interfaith Community Clinic become more self-sufficient outside of the funding from local hospitals. Founded by Dr. Joel Kerschenbaum in 1996, Interfaith Community Clinic (formerly The South County Community Clinic) provides a medical home (medical, dental, and mental health services) to the uninsured residents of Montgomery County. The Clinic focuses not only on treating patients, but also educating patients and their families to address the root causes of healthcare issues and providing them with the knowledge and tools to practice healthy lifestyle habits. The clinic averages about 10,000 patient visits per year and does so with volunteers who work as licensed healthcare providers. “We at the clinic are blessed to witness this work every day, and that is all because of someone like you,” Missy Herndon, the CEO and President of Interfaith, said. For more information, please visit interfaithcommunityclinic.org or call (832) 615-8225. Click here to read more about the Women Empowering Women luncheon event.